The day after Christmas I made the trip to Connecticut to see Drew, we didn’t really have any solid plans other than to let the dogs play and maybe we would play with and photograph our JKU Jeeps. I don’t think I was there an hour when Drew suggested we do a shopping trip to Woodbury Commons Premium Outlets in New York. Off we went. This was our second trip to Woodbury Commons and I was pretty excited because when we went last May I got some pretty amazing deals. I figured this trip would even be better with the after Christmas sales. We visited all my go to stores for my favorite girl stuff like American Eagle Outfitters, Columbia, Coach, Express, Hunter, Michael Kors, Nike, Under Armor and The North Face to name a few. Unfortunately though we were a little pressed for time and the stores were mobbed. Nike probably had 150 people in line. 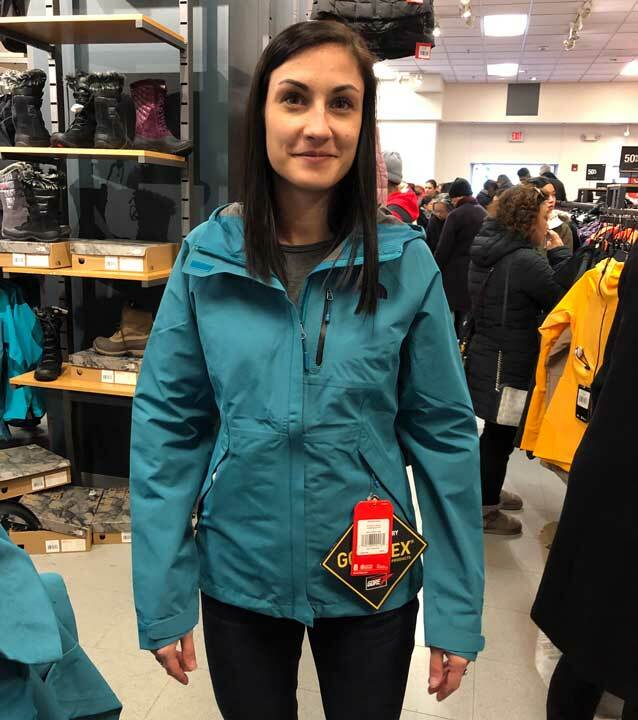 It was crazy so I didn’t buy as much as I wanted but I am really happy with one purchase, my The North Face Dryzzle Jacket. The Harbor Blue Heather Dryzzle Jacket was originally $199 and I bought it for $79! Color: The color is not something I would normally pick and BTW the LED lighting in the store doesn’t provide an accurate representation of the color. I mostly buy black jackets but this color with it’s heathered look really caught my eye. The North Face Logo is black not purple like some internet pictures. The zippers are also black and that’s important to me to match my wardrobe. I wouldn’t have bought it with a purple logo, I’m picky lol. Fit: The jacket is super thin and somewhat form fitting and fits me great like most of my other North Face jackets. It’s contours fit my shape PERFECTLY. There’s not much room for layering so buy a size larger if that’s important to you. 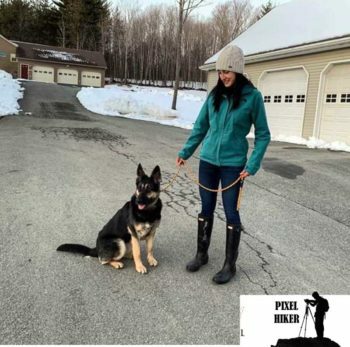 Function: I noticed some reviews mention the Dryzzle jacket is not as waterproof as expected. The day after I bought this jacket we did more shopping and it was a rainy day. The jacket repelled water just fine as we went from jeep to store and store to store. I bought this jacket because it looks great, it’s waterproof and a windbreaker. I would have no problem using it on some light day hiking but let’s be honest a jacket like this wouldn’t be my first choice for serious hiking where bad weather is a possibility. This jacket is more about light outdoors and fashion than exploring. That should be obvious. The hood and pockets are typical North Face, the external chest pocket is where I usually keep my iphone and Jeep keys. 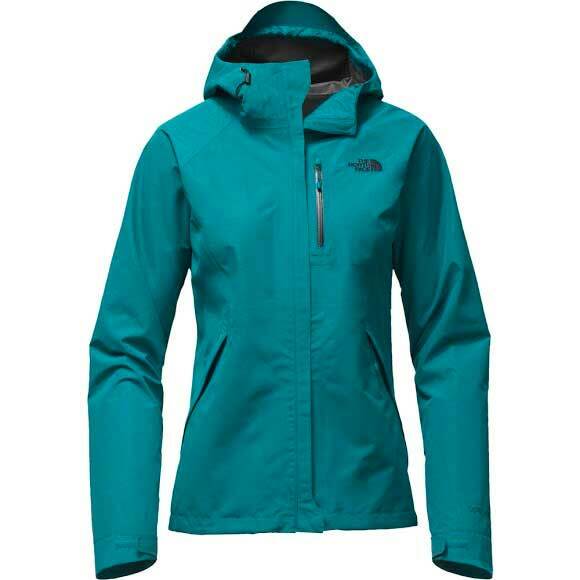 The North Face Women’s Dryzzle Jacket is a stylish, light, well fitting water repellent windbreaker.